Mentioned in the media on a consistent basis instantly positions you as a leader in your industry. That's huge! But how do you achieve this consistency? In our initial "Market2Media" series, we show you what not to do when working with editors. Editors don't have time -- ever. They like to work as efficiently as possible, so it's important that you don't waste their time. 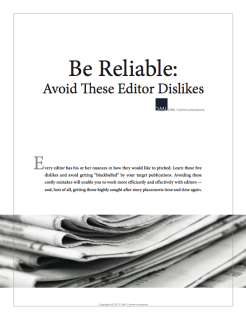 In this first installment, you get five editor dislikes to avoid to make you a reliable and credible resource for consistent press placements -- which can save you thousands of dollars in advertising and ultimately boost your bottom line along with your leadership position. Check it out today! Stay tuned ... more "Market2Media" products in production and coming soon!